We expend so much effort to create enchanting family memories during the holidays, so it’s always disappointing when our photos end up being more Muggle than magical, more hapless than hygge. Here are three photography tips which will take your holiday Instagram game from dull to delightful in the click of a shutter. What with tree lights and sequins, candles and glitter, and the stunning diamond earrings your husband has no doubt placed under the tree, the holidays are hands down the sparkliest time of the year. As a general rule twinkles look more entrancing when slightly out of focus, so you get that interlocking spheres effect known to pro photographers as ‘bokeh’. This effect is achieved by creating a shallow ‘depth of field’ where the subject is in focus but everything behind and in front of the subject is somewhat blurred. Newer phones can do a good job with this if you set them to ‘Portrait’ mode and tap on the part of the image that you want to keep in sharp focus, though this mode often doesn’t work quite so well in low light. If you have a camera where you can change the settings, this is the time to break out the manual and figure out how to change the aperture. Choose the subject you want to focus on, set a low aperture number, around f/2.8 rather than f/11, and hey presto you will have created that magical background blur. If you have a camera that allows you to manually adjust the focus then it can be fun to play with blurring your twinkly scene completely to create a dreamy, romantic image – check out the #bluronpurpose hashtag on Instagram for inspo. And finally, since it’s often quite dark when we’re photographing sparkles, remember to support your phone or camera on something to minimize camera shake – a tripod, a stool, really anything will do. There is such a thing as too much blur. They say that it’s the ‘little things’ that matter, and no more so than at this time of year when we put so much energy getting the details of everything just so – from choosing just the right wrapping paper, to bringing out the festive china, hanging kidmade ornaments and donning our favorite ugly sweaters and Christmas PJs. Oftentimes it’s these tiny charming touches which are imbued with our deepest and fondest memories, and yet we rarely focus on them in our photography. 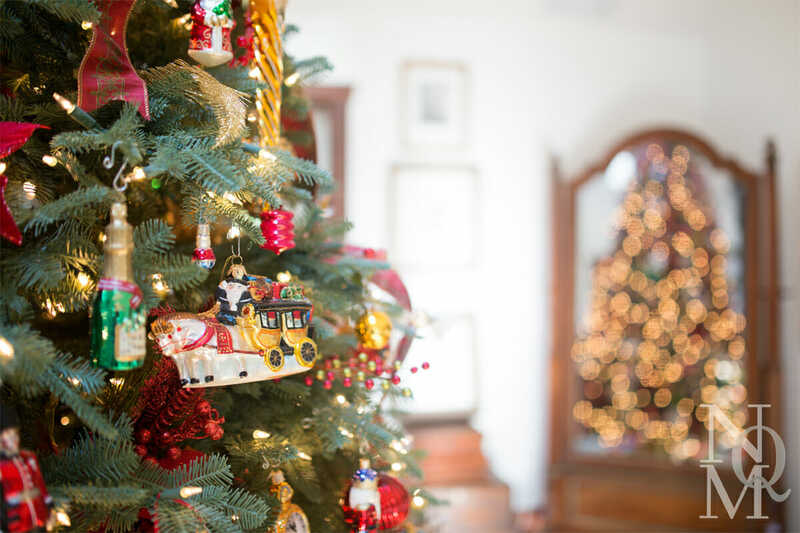 This year take time amidst the holiday madness to hone in things like favorite ornaments, place settings, floral decorations and silly gifts. This is another great time to use the Portrait mode on your phone or set a low aperture (see above) for a shallow depth of field, so that you bring the important details into sharp focus and blur out the less important elements. Detail shots will round out our record of the holiday and bring an extra dimension to family albums, add interest to your Instagram feed and no doubt trigger animated conversations about the Lego train set in years to come. Of course you want to capture your teenager’s expression when he unwraps yet another pair of comedy socks from grandma, but at other times focusing on something other than faces brings a different perspective, adds variety to your slideshow and makes your photographs more original and unusual. Hands are especially busy at this time of year – crafting, baking, decorating cookies and trees, unwrapping presents and pouring wine – and usually have an eloquent story to tell, from the velvety soft but grubby hands of your preschooler and your tween’s chewed fingernails, to your sister’s festive manicure and grandad’s gnarled, weather beaten fingers. This is another opportunity to use Portrait mode on your phone, or set a low aperture number (see above) for a shallow depth of field. Isolating the hands by bringing them into sharp focus while blurring the background allows you to bring laser-like attention to a holiday activity, and including hands in detail shots brings life to the image by adding a human element. Asking little kids to hold things or point out their favorite decorations or toys is also a good way of helping them to enter the moment, feel less self-conscious and behave more naturally in front of the camera. Cheers! Have a happy holiday season and have fun thinking out of the box to get your best Christmas photos yet! Guest contributor: Paola Thomas is a British food and travel photographer currently living in Seattle in the glorious Pacific Northwest. Food is her joy and she loves to document the stories behind our food and the people who produce it, cook it, sell it, eat it and love it – not just in the US but all over the world. She’s a mom of a high school freshman and refugee from the corporate cubicle in her previous lives as an investment banker and management consultant. Paola recently made the transition to full-time freelance photography and writing, is a regular contributor to Edible Seattle where she photographs and writes feature articles and develop and photograph recipes for her regular seasonal cakes column. She also writes and photographs a weekly travel and lifestyle column for Komo News’ online magazine Seattle Refined and is a regular contributor to Zagat’s Seattle. Paola’s website and check out and follow her on Instagram @realpaolathomas. Read 3 Steps to Taking Family Photos Like a Pro for more photography tips!